SYRACUSE, N.Y. - An East Syracuse contractor has begun work on the first phase of a $23 million overhaul of Baker Laboratory on the campus of the SUNY College of Environmental Science and Forestry (ESF). The building, which will be completely renovated, contains faculty offices and laboratories for the college's Faculty of Construction Management and Wood Products Engineering. Also housed in the building are academic computing facilities and the analytical and technical services department. 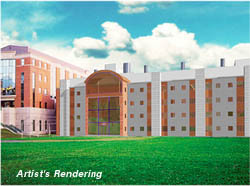 The renovated Baker Laboratory will provide the college with a center for engineering and technology, and a new home for the college's Faculty of Environmental Resources and Forest Engineering, with its specialties in water resources, mapping sciences and geographical information systems. "We are thrilled to see the spaces in Baker opening up to expand our teaching, research and outreach opportunities," said George Kyanka, chair of the Faculty of Construction Management and Wood Products Engineering. Murnane Building Contractors Inc. was awarded an $8.5 million contract for the first phase of the project, which will be a renovation of a one-story wing on the west side of the building. Work on this phase is expected to last two years. The project includes construction of two multimedia lecture halls, a "smart" classroom outfitted for computer use and distance learning, and two construction management and planning studios. It will also modernize facilities tailored to the needs of Kyanka's department for materials science testing, including a modern dry kiln, a wood identification laboratory, shop facilities and a laboratory that will allow for humidity and moisture conditioning of wood samples. When completed, the one-story wing will also include temporary facilities for operations that are normally housed in the four-story section of the building. Work on that larger section will begin after the first phase is completed. Baker Laboratory, constructed in 1957, was the long-time home to both the chemistry, and construction management and wood products engineering faculties. The chemistry faculty moved in 1997 to the new Edwin C. Jahn Laboratory. The building is named for Hugh P. Baker, who was dean of the college from 1912 to 1920, and again from 1930 to 1933. The 133,500-square-foot laboratory houses the Tropical Timber Information Center and the Nelson C. Brown Center for Ultrastructure Studies. When the renovation is complete, Baker will also be the site of ESF's NASA Affiliated Research Center.